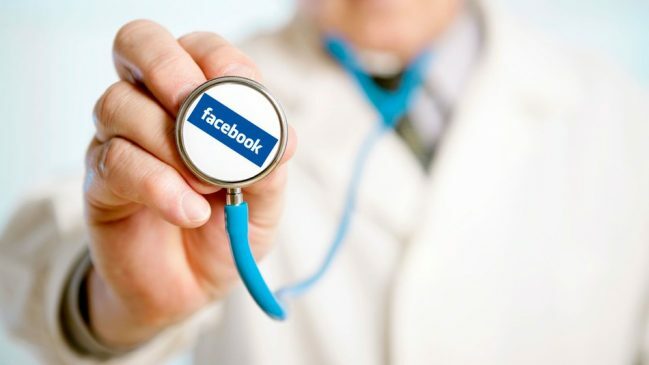 Facebook is normally a place where we get lost in the noise, looking through old photos of friends we lost touch with and also spending countless hours just scrolling through our news feed. But it’s also a tool we can use to help us with our depression. 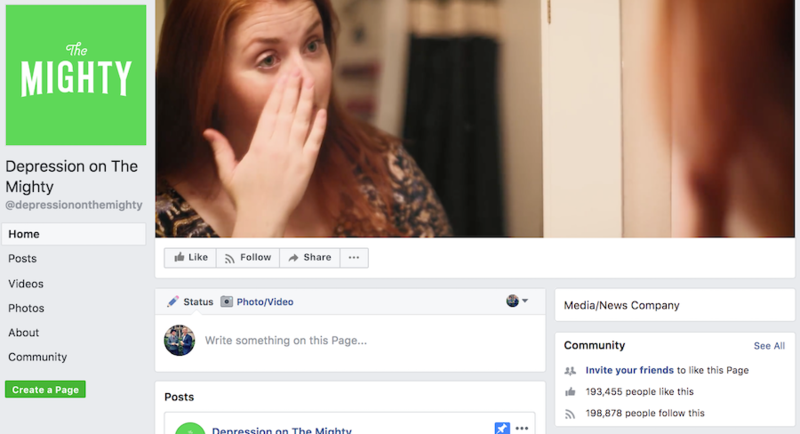 From depression support groups, to chatting with people suffering with depression, or more simply following Facebook pages that raise awareness for depression. 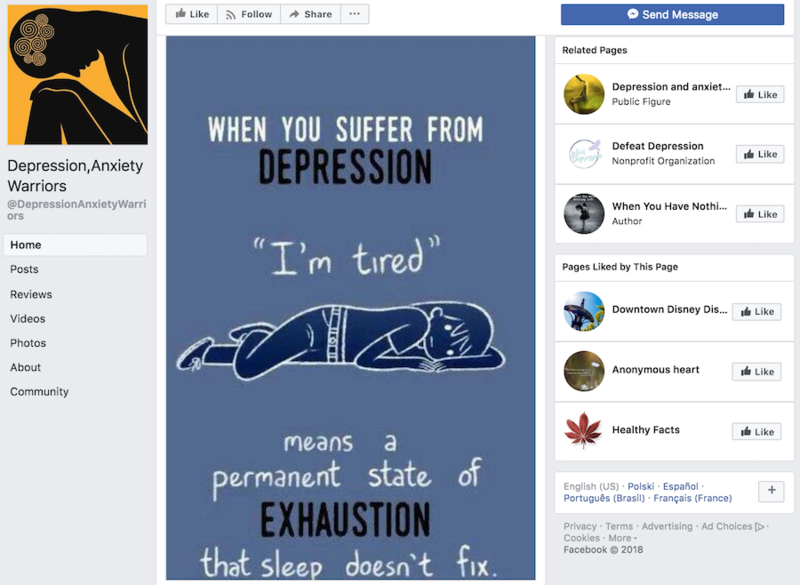 In this post I wanted to round up a few of my favourite Facebook pages that help with depression. 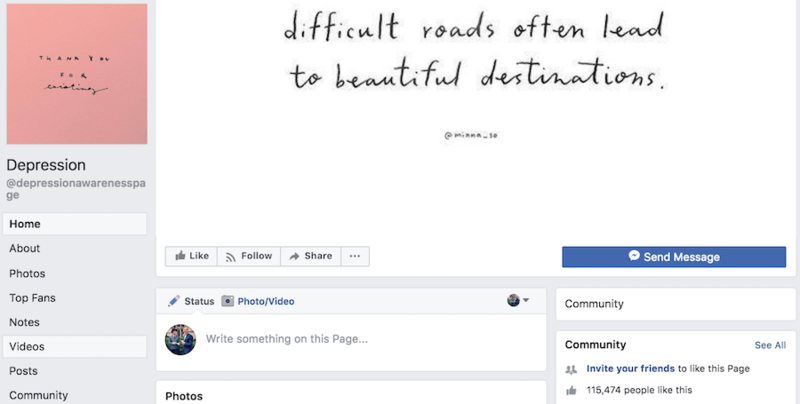 From sharing quotes to videos, these pages look to break the stigma surrounding mental health and depression and also support you on your recovery. 1 in 4 is a page that shares quotes and resources around mental health in general, but has a strong emphasis on depression. 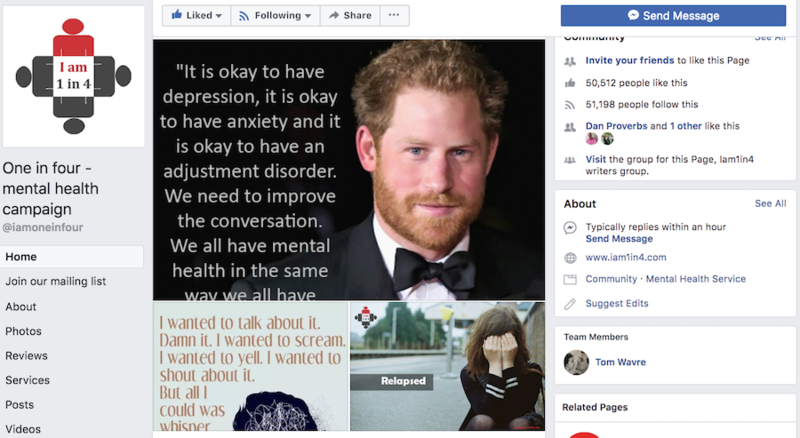 The page was set up by Tom Wavre with an emphasis on the fact that 1 in 4 people will suffer with mental illness in any given year, and their aim is to help reduce the stigma around mental health. I met Tom at a recent mental health event in London called Can Anyone Hear Me and I wanted to send some love his way for the work he’s doing. We share the same passion that social media has negative effects on our mental health, but it’s also a tool that if used right, can create huge awareness for depression and mental health. The Mighty do some great work raising awareness and offering help around mental health. Unlike a lot of popular publications, they don’t just share the odd mental health post every now and then. Instead, they have a variety of pages on Facebook set up for different purposes. Anxiety on the Mighty, Eating Disorders on the Mighty, OCD on the Mighty and of course, Depression on the Mighty. With regular updates to articles raising awareness and offering help for depression to short, hard hitting videos, the consistency and high quality content really caught my eye. What caught my attention with this page is the live streams and videos from Matthew Baker and also the messaging service they provide. 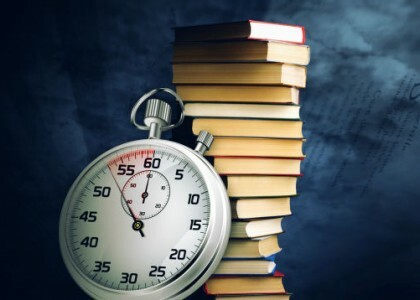 As with most pages, quotes typically get the most shares and attention but in terms of value the live streams and messaging service are something to check out. Personally, video is a powerful form of media. Especially when it’s discussing depression, topics people typically are afraid of talking about. The message service is free and it’s as simple as messaging the page and then getting daily tips to help with your depression recovery. Set up by John, this page was set up to help people with depression feel less alone. He strongly believes that every like, comment and share with each post around depression can help fight the stigma. In the video he created 5 years ago, he states “we’re all just people, whether we have a mental illness or not”. Here’s a slightly different one, memes based around depression. Depression isn’t a laughing matter, but these memes are highly relatable if you’re suffering. Reading through some of them, I almost chuckle to myself and shout “THAT’S ME!”. Sometimes laughter is the best medicine, so check out some of their memes. This page was set up for everyone battling depression and anxiety everyday. It gives you a platform to discuss your thoughts and stories around depression. With this page you can mostly expect quotes, but also links to articles with people sharing their own story about depression. 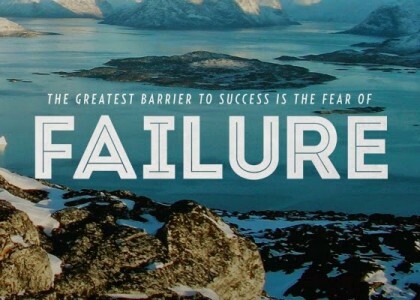 As I’ve said before, the more people that share their story openly the more people will feel they can too. I first found out about this page from YouTube, as I’ve seen a few of Scott’s videos there. Scott is a Mental Health Advocate and the Founder of Depression to Expression. He has been sharing his story of depression and anxiety for over 5 years and teaching others to feel confident in their self-expression. Scott’s message has reached over 4 million people though online media which supports the fact that the need for mental health education is needed. 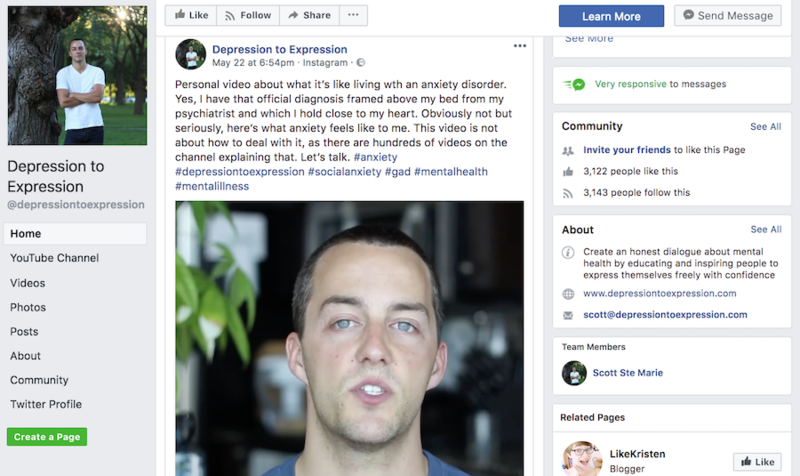 On the Facebook page you can expect videos from Scott, quotes and links to resources to help with your depression. 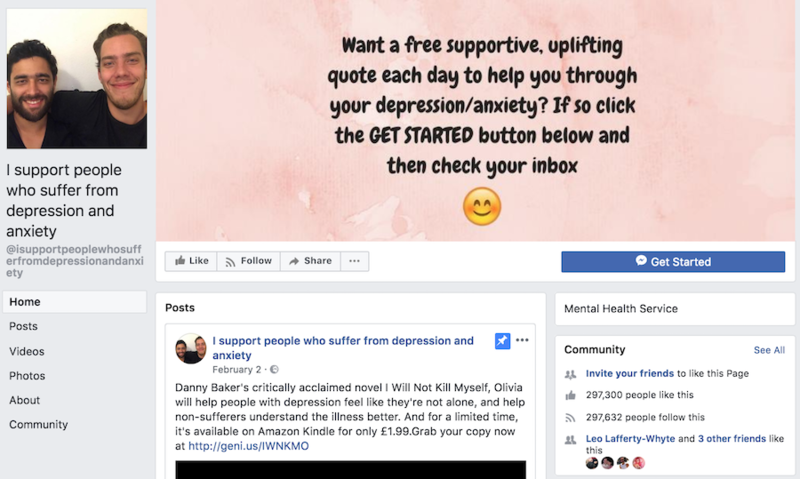 I’d love to hear some pages/people you follow on Facebook that have helped with your depression? 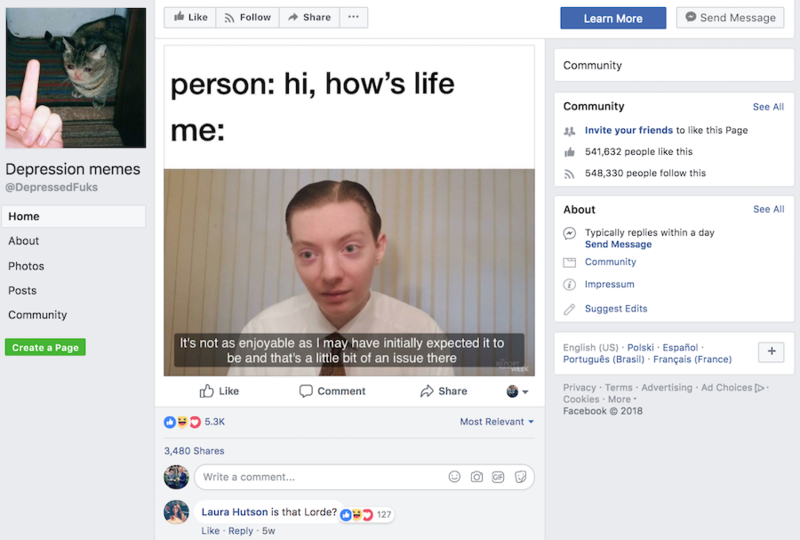 Of course, there’s always my page too 😉 – where I share daily content to reduce the stigma around mental health and share my story to help inspire others. This post wouldn’t be complete without a cheeky plug right?